WonderSoft Multimedia Solutions AWS Web Hosting Services are a designed to provide you reliability, performance, security or support. Our certified experts are here to help you in getting the most out of AWS. Why AWS Cloud is the way to go? Amazon Web Services are one of the most reliable tools to manage a dynamic web application. Irrespective of the size of your application, AWS will support it without compromising its features and performance. WMS has garnered a reputation of being a company competent at solving complex scalability problems and provide expert AWS Hosting services. We specialize in hosting services because we offer solutions which are designed to be modular. We offer AWS Web hosting full suite of services because we possess the knowledge of every nook and cranny. 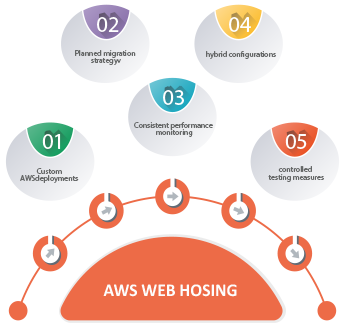 We deploy best AWS web hosting services to ensure your environment is designed for high availability, performance, security and scalability.